Richards relates the college’s life story from its earliest days to its closure. He places the college in the context of the Dartington Estate from the 1920s onwards when the Elmhirsts purchased it as the focus for their project of rural regeneration. He shows how the college was genuinely innovative in many ways. He situates the work of the college in the social, political and artistic developments of its time. He tells the story from the inside via interviews, documents and personal reflection. Finally, he discusses the end of the college and the political forces that led to its closure. 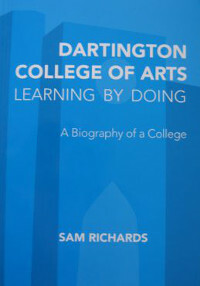 Author of three other acclaimed books – Sonic Harvest (1992), John Cage As… (1996) and The Engaged Musician (2013) – Sam Richards was a student and part-time lecturer at Dartington College. He is a pianist, improviser and composer, as well as a writer and broadcaster.